Press photo by Charlotte Haslund-Christensen, 2015. WHO’S NEXT? (portraits of LGBTQ People) by Danish artist Charlotte Haslund-Christensen is part of the group exhibition ‘LIGENU’ in front of the Danish parlament in Copenhagen, Denmark. The exhibitions runs through October 18. 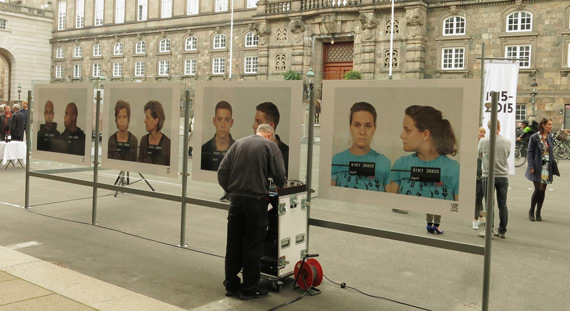 In 2009 Charlotte Haslund-Christensen photographed over 40 LGBT (lesbian, gay, bisexual and transgender) people at Copenhagen’s main police station – capturing them in mugshots like the criminals they would be many places in the world. The art project WHO’S NEXT? is a comment on the fact that 76 countries continue to criminalise homosexuality – that LGBT people are still stigmatised, attacked and killed, with at least 5 countries making being gay punishable by death or life imprisonment. A smaller version of the travelling exhibition will be exhibited August 10 – September 13 at the Hovedbiblioteket (the library), Rendsburggade 2, 9000 Aalborg, Denmark and September 14 – October 18, 2015 at the Rådhuset (the town hall) Torvegade 74, 6700 Esbjerg, Denmark.